November 15, 2017 November 15, 2017 - by Energy Log Staff - 6 Comments. After booming at a phenomenal growth rate, Solar Industries across the globe are now facing massive challenges for survival. The massive growth — propelled by networks of manufacturers and traders — lead to cut-throat competitions, and hence dip in costs and margins. But, all of a sudden, the dynamics and economics of the industry have changed. One of the essential raw materials needed for the manufacturing of panels is witnessing an unexpected shortage, causing a sudden rise in overall costs. Bloomberg has recently conducted a study to explore the demand-supply crisis in the solar industry. As per their study, solar manufacturers across the globe are struggling the rising costs and lowering margins battle. As per their report, prices of polysilicon, the main component of photovoltaic cells, has spiked by around 35 percent in the past four months. The crisis started after environmental regulators in China shut down several factories. Earnings of manufacturers in China is seeing big dips. Canadian Solar Inc. and Hanwha Q Cells Co. have already reported steep declines in profit, and other companies will probably be affected as well, including JA Solar Holdings Co., which reports results Wednesday, and JinkoSolar Holding Co., the biggest publicly traded panel producer. According to Bloomberg, the price spike came after an environmental crackdown in China coincided with an annual lull in polysilicon output. Refiners in China typically cut back polysilicon production during the summer for routine maintenance. Solar manufacturers anticipate the seasonal slowdown, but it was exacerbated this year when China’s Ministry of Environmental Protection shut down several plants that make metallurgical silicon, a partially refined polysilicon that other companies further purify for use in solar cells. The two events led to a polysilicon shortage that drove prices in China from $14 to $19 a kilogram over the past four months, according to Guelph, Ontario-based Canadian Solar, which has most of its manufacturing in China. “We didn’t expect the polysilicon price to go so high inside China and nobody expected it,” Chief Executive Officer Shawn Qu said on a Nov. 9 call with analysts. The second-biggest solar company’s gross margin slumped to 17.5 percent in the third quarter, from 24.2 percent in the second quarter, and its net income was less than half of what analysts were expecting. International trade disputes have made it difficult for Chinese manufacturers to look elsewhere for cheaper polysilicon, Driscoll said. Four years ago, China imposed steep tariffs on high-quality polysilicon imported from the U.S. and South Korea, essentially forcing companies to buy locally. Polysilicon is semiconducting material that’s refined from quartzite, a dense rock created when sandstone is crushed between tectonic plates. China-based companies including GCL-Poly Energy Holdings Ltd. and Xinte Energy Co. bake the material in giant ovens and treat it with chemicals until it condenses into ingots of near-pure polysilicon. Those ingots are sliced into wafers using diamond-edged saws, and then cut into squares to make solar cells that transform sunlight into electricity. Third-quarter net income at Hanwha fell 88 percent from a year earlier to $5 million, in part because of “downward pressure on gross margin, caused primarily by increasing wafer prices,” the South Korea-based company said Nov. 10. JA Solar declined to discuss the issue until after its third-quarter results are released this week. JinkoSolar, which has not set a date to issue its results, didn’t respond to requests for comment. Polysilicon prices vary by region. 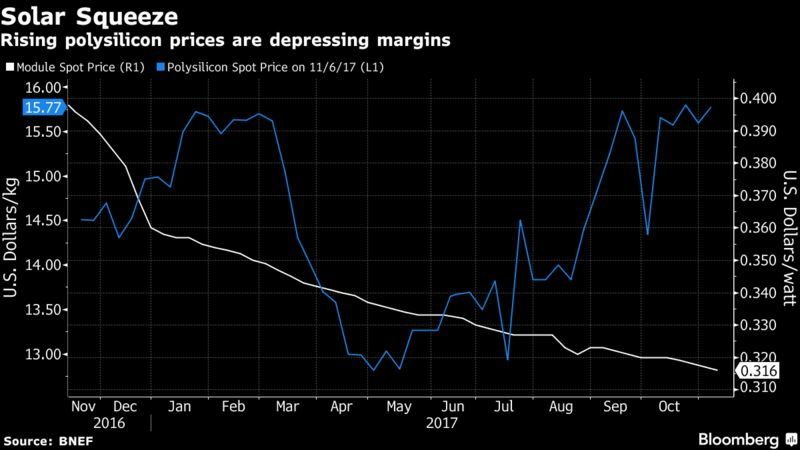 A Bloomberg New Energy Finance index of average global spot prices shows polysilicon climbed to $15.80 a kilogram in October, the highest since July 2016. That’s well below the record set in 2008, when the solar industry first began to boom and prices spiked to $475 a kilogram. GCL-Poly, China’s largest supplier of the material, climbed to an almost two-year high in Hong Kong trading Tuesday. The shares have gained more than 80 percent since the start of the third-quarter. Solar companies’ exposure to prices will vary, in part depending on the length of their supply contracts. Energy storage will be a necessacity for managing intermittent Renewables in grid. And yes it will put Utility under tremendous pressure for innovative plans to retain its customers..
Is there any time line where we can see a downfall or it will going to be lasting for long. Will this remain local to China?